Chicago, Ill., Feb. 13, 2003 - If it's worth doing, it's sometimes worth overdoing. 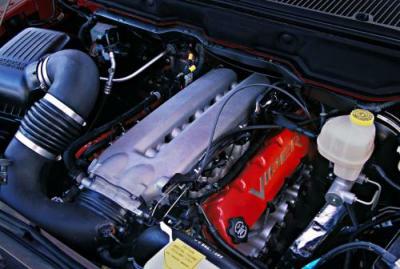 So only Dodge could create the boldest, baddest and fastest full-size pickup ever, the Viper-powered 2004 Dodge Ram SRT-10. Taking its rightful place as the ultimate performance pickup, the 2004 Dodge Ram SRT-10 brings a massive dose of Viper power to the performance pickup segment, with a class-demolishing 500 horsepower and 525 lb.-ft. of torque. 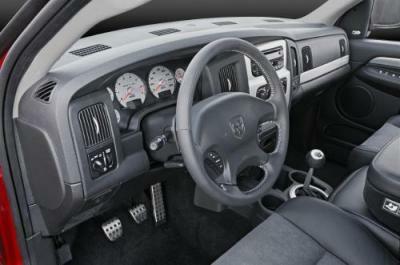 Topping 150 mph in maximum speed and reaching 60 mph in approximately five seconds, Dodge has recalibrated all expectations for truck performance. "The Dodge Ram SRT-10 may be the first halo truck, but trust me, this truck is no angel," said Wolfgang Bernhard, Chief Operating Officer, Chrysler Group. "The Ram SRT-10 is true to the performance ideals that created the original Dodge Viper: keep it simple and make it fast." "There is no replacement for displacement," added Bernhard. "The Ram SRT-10 delivers its astounding performance in a way that only Viper owners will recognize, with an endless rush of torque." 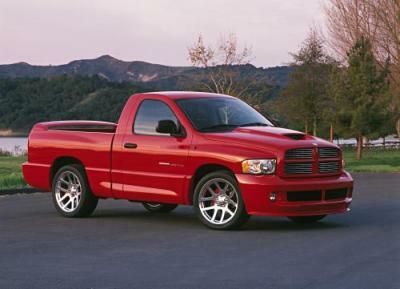 The numbers don't lie: the Dodge Ram SRT-10 is the most outrageous pickup ever. With 500 horsepower, 525 lb.-ft. of torque, 505 cubic inches and a 500-watt, ear-melting sound system, Dodge dominates in every category. Simply put, the 2004 Dodge Ram SRT-10 is the new performance truck icon. The Ram SRT-10's mayhem-making ability is delivered courtesy of the highest displacement engine in a factory pickup truck-the same 8.3-liter V-10 that powers America's ultimate sports car, the all-new 2003 Dodge Viper. The V-10's horsepower rating easily surpasses all other pickups - not to mention virtually every production sports car in the world. "We set out to create the Viper of trucks and we delivered," said Jim Schroer, Executive Vice President - Global Sales and Marketing. "This is a unique truck - a low volume, over-the-top collectible that remakes the entire segment. In the performance truck segment, the Ram SRT-10 simply dominates the road - and proves once again that Dodge DNA runs true and deep."